Nova Scotia’s eastern positioning puts the province at risk for mercury emissions – and it has nothing to do with how much we produce. “Mercury tends to increase in fish as you move eastward. The water here is more acidic and brown and affects the mercury chemistry,” said Campbell. 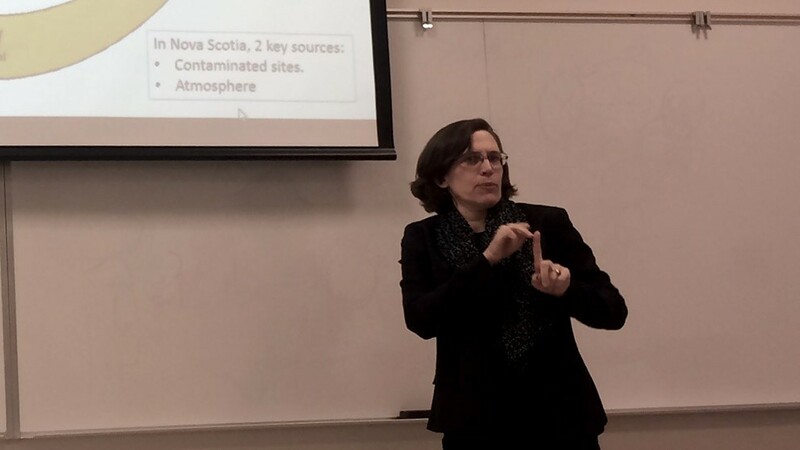 This past Friday, Dr. Linda Campbell, a senior research fellow at Saint Mary’s University, gave a lecture at the university on mercury emissions in Nova Scotia. This lecture, which is part of a trio of talks regarding the environment, focused specifically on the effect that these emissions have on fish populations. A large reason for the existence of mercury in Nova Scotia is the plethora of gold mines that were built all over the province. Mercury is used to help extract gold, and once mercury is in the environment it does not break down. It stays in the system, building up over time. The Montague Gold Mine in Dartmouth is located near Loon Lake. Campbell set up a study site in a wetland area between these two locations last summer and found that the site was very high in mercury and arsenic. Campbell said that the study site is being considered for development and that if the land is disturbed and housing is placed there, it could be a huge risk. Campbell said that this is dangerous because mercury can affect people’s immune systems and has even been linked to lowered IQs. Because Nova Scotia’s water is acidic, inorganic mercury is easily transformed into methyl mercury. This type of mercury is toxic and can affect the nervous system. Canada has taken steps to lower its mercury emissions and signed a treaty on Jan. 23, 2013, at the UN Minamata Convention. The treaty was created to reduce mercury emissions and recognized the matter as a global issue. Campbell said there are ways the public can help to reduce the emissions. Darren Fisher, the Liberal MP for Dartmouth, recently put a proposal together for a bill to regulate the disposal of these light bulbs. If the bill passes there will be a better and more safe recycling process. The third and final talk in the trio will be held by Kristoffer Archibald at Saint Mary’s Loyola Building on Friday, March 11.